At Sun and Sea Manor, we serve the Imperial Beach, South Bay, Chula Vista, & South San Diego area. We are committed to the health & flourishing of all our residents with a loving embrace designed for whole person well-being! Read on to find out more about the benefits of superfoods and following a Mind Diet. Well, we all love food, and we Americans love superlatives! So what could be more attractive than a SUPERFOOD? Certainly, much of the energized talk around these edibles is marketing hyperbole generated to sell products. As soon as a study comes out showing a health gain associated with a food substance, the headlines begin to fly. But the good news is that a lot of research has demonstrated the efficacy of many of these nutrient-dense whole foods. We simply have to use a measure of common sense in understanding and implementing their presence in our diets. Research continues to confirm that we are what we eat – especially our in regards to our delicate gray matter, and substituting some of these powerhouse choices for our less healthy fast food can make a big difference over time! Mom always said, “Eat your veggies!” It’s still true. Vegetables are the most frequent stars in the superfood constellations compiled by various doctors and organizations. The fiber helps quell appetite and keep blood sugar in check and supports all the systems of the body because it aids in proper elimination. But added vitamins, minerals, and “cell damage fighting” antioxidants add to their “super” status. Dark leafy greens offer a particular bonus to brain health, as they contain the precursors to fats that create our brain cells. Weird – yes? Our brains are not green, but these guys; kale, spinach, chard, collards, beet greens & leaf lettuces; they are all packed with brain protecting power. If you haven’t already, it is worth cultivating a taste for them! Cooked or raw, they top many lists in the #1 category. Sweet potatoes, acorn, butternut and kabocha squashes, are all rich sources of vitamins and fiber and are deliciously sweet. If you haven’t tried sweet potato fries, instead of the regular fare, you’re missing out! Broccoli and all of her sisters in the cruciferous family: cabbage, Brussels sprouts & cauliflower are said to be the cancer fighters! Berries top the super list of fruits – the more color the better. And research has singled out blueberries as a potential dementia prevention food. A simple rule to follow is the more color in the fruit or vegetable, the more antioxidant power. Scientists discovered that the substances that give the bright and beautiful hues of our plant foods are also the nutrition holders called phytochemicals. Whole grains are recommended over the all-white varieties, as they add extra fiber and the most nutritious parts of the plants, the bran, and the germ. Quinoa has become very popular for those who are gluten sensitive. Fish, especially salmon, and the smaller fishes, such as sardines, mackerel, and anchovies contain omega 3 fatty acids. Our brains are 70% fat, and they need good fats to maintain function and repair. These fish oils have a sustained “two thumbs up” from both cardiologists and neurologists for the heart health benefits and brain protection. Seeds and nuts also have the “good fats” that our brains crave. Almonds and walnuts have gotten the most research. Moderation is the key, as the calories mount up fast. And dark chocolate – everyone knows that by now! It, too, is a health food! It has been shown to lower blood pressure, improve blood flow, and boost overall heart health. Choose chocolate that is at least 70 percent cacao or cocoa to optimize the antioxidant power. Bonus – some studies suggest that dark chocolate may even boost your mood. So, prevent or cure dementia? There have not been any conclusive studies that demonstrate a cure for dementia. But there have been many very well researched and documented studies that demonstrate the value of a healthy diet in the prevention or delay of dementia symptoms. The most deeply researched diet with conclusive positive results in preventing cognitive decline from advancing to dementia and for delaying the onset of age-related Alzheimer’s is the Mediterranean Diet. Rich in plant-based foods (like those listed above), beans & legumes, fish & fowl for protein, moderate red meat, with particular emphasis on olive oil and nuts for their healthy fats and cell protective properties. 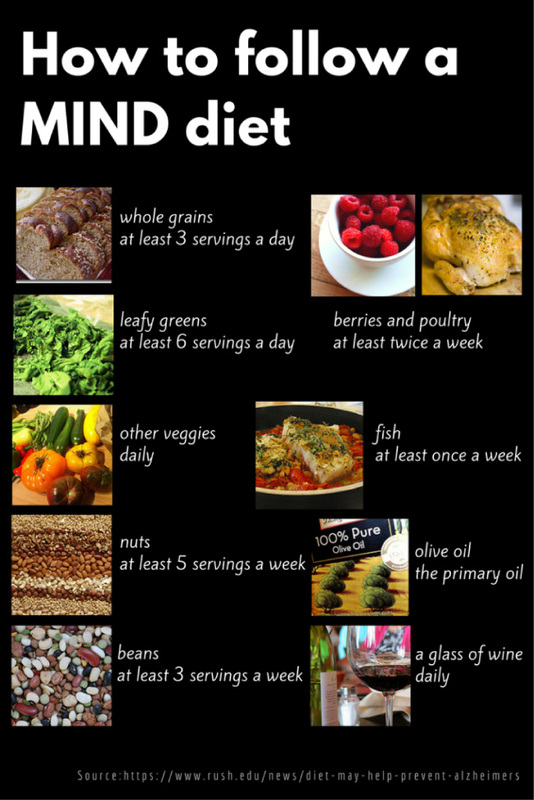 Another variation called the MIND Diet integrates the Mediterranean-DASH diet (DASH is used primarily to lower blood pressure) with the particular emphasis on dark leafy greens – 6 cups of them per day! Remember the bit above about how the dark leafy greens are the precursors to the fat that comprises the brain? Well, this research showed: “In the study, among people who followed these diets most closely, the MIND diet group were 54 percent less likely to develop Alzheimer’s disease.” That is powerful! Salad anyone? Grapes, especially dark-colored ones, are loaded with phytochemicals, antioxidants that may help protect against cancer and heart disease. Two of those phytochemicals, anthocyanin, and proanthocyanidin, may be especially good for your immune system. Grapes also contain vitamin C and selenium. Recent animal studies suggest that blueberries may help protect cells from damage and lower inflammation. Blueberries contain many of the vitamins and minerals are known to strengthen the immune system, along with key phytochemicals that may help protect against cancer and heart disease. Most nuts also contain phytochemicals such as resveratrol and plant sterols, which help lower cholesterol. Popeye had a point: It’s tough to compete with the nutritional muscle of broccoli and spinach. Kale and collard greens are also members of the esteemed dark green vegetable group. These super veggies are high in nutrients that help fight disease, including vitamins C, E, and A, and calcium. They’re also loaded with magnesium and potassium. With one sip of tea, you get two potent phytochemicals — anthocyanin and proanthocyanin. Both are antioxidants that help fight inflammation. Add to that a healthy dose of catechins, antioxidants that are thought to block cell damage that can lead to cancer. The lowly bean is tops in antioxidant activity. It offers an amazing package of nutrients, including many vitamins and minerals. Green soybeans and soy provide vitamin C, calcium, zinc, and selenium. Lentils and black-eyed peas are rich in folate and zinc. Black beans and kidney beans also offer a good amount of folate. Elaine Magee, MPH, RD, is the “Recipe Doctor” for WebMD and the author of numerous books on nutrition and health. Her opinions and conclusions are her own. All colorful fruits: blueberries and all berries, cherries, red grapes, mangoes, melons, etc. More color = higher nutrient density! Spinach & all dark green leafy veggies – most beneficial to the brain! Whole grain bread, pasta, rice, couscous, polenta – try it, you’ll like it! Olives, avocados, almonds, walnuts, pecans, peanuts, sunflower & pumpkin seeds – all “good fat” sources! Sweet potatoes, squashes, onions, tomatoes, broccoli, carrots, peppers, garlic, capers & any other veggie you like! Yogurt – only if dairy agrees with you. Substitute olive oil for butter. Use coconut oil in place of other fats. Spices: curry, turmeric, ginger, garlic, coriander, cardamom, garam masala – these savory seasonings all have protective qualities! Keep it as fresh and “close to nature” as possible! If you can’t pronounce it, don’t eat it! —Dr. Peter Whitehouse, M.D., Ph.D.